Between 1947 and 1969, the US Air Force meticulously recorded over 10,000 incidents involving Unidentified Flying Objects. 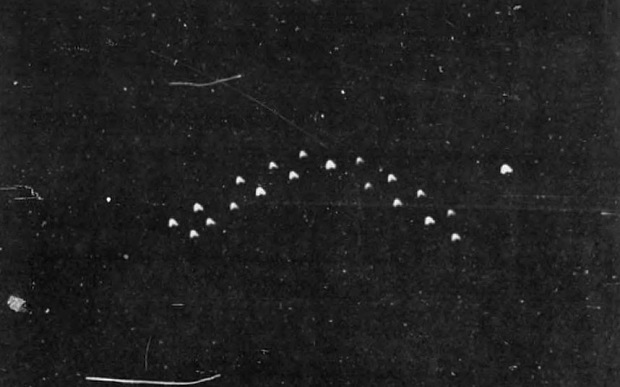 Inside the Project Blue Book archive, which has recently been put online, witnesses described objects as “concave as a soup bowl”, “onion-shaped” and resembling “a frosty silvery football” shooting across the sky. A seed salesman was driving when he saw a flash of light. When he moved closer to the light, his car stopped working. The light came from a nearby riverbed where he saw an object, resembling a balloon. When he approached the space ship, another flash of light paralysed him. He was unable to move as two men appeared and began to search him – they asked if he was armed. After the search, he was able to move again. He asked the men if he could take a closer look at the UFO. They agreed. Inside, he met four men and two women. They all spoke in German accents and seemed to move around on magnetic fields. The sides, bottom and floor of the ship were perfectly transparent. After around thirty minutes, they said goodbye. After leaving the UFO, it rose 150ft into the air and disappeared. At the same time as the sighting, a farmer’s truck broke down two miles away. During the investigation, a blue stain was found on trees near to the scene and green oil was found covering dry leaves. However the man was assessed by psychiatrists who said his “mental condition” would enjoy publicity. He was later committed to the state mental hospital in Hastings, Nebraska. An Argentinian truck driver was looking for a hotel to spend the night when he saw small red lights, four miles from Isla Verde. When he got closer to the lights, his engine cut out. Hoping he might find somewhere to stay, he left the car taking with him a blanket and a gun. He thought he saw the lights of a vehicle. However these lights disappeared and in their place he saw powerful rays of red light coming towards him. There was a smell of gas that made his eyes and face sting. Frightened, his knees gave way and he shot at the light with his revolver. In response “the light gave out a sound, like the rapid braking of a car and went backward a few meters”. He fled into a field looking for a shelter however from a hill two red lights appeared which “reflected” his steps. The red light continued to follow him as he walked around, confused. Then a blue lit “vineyard shaped vehicle” appeared. He said it had two small windows and inside he could see someone “but I didn’t see legs or faces, just a body type form”. Six hundred feet from the object he saw four human beings “or whatever they were”. He asked them questions but nobody replied. They just walked beside him. They were 6’5″ tall with a sparkling uniform. One of them came very close with a triangular object in his hand. The truck driver was again afraid and so fired another shot and it was “as if a shadow had fallen backwards”. They returned to the vehicle and the large object passed him overhead. A blue light however did not leave the man until he reached the city. The investigation confirmed that the truck was at the place the man had said it was and his footprints were also found. However the US Air Force received only second hand evidence from the Argentinians and decided it was too expensive and too much time had passed to continue the investigation. Horace Burns was driving his station wagon when he saw a huge metallic object flying in the sky. It was crossing the highway about 200ft ahead of him when his engine cut dead. For approximately 90 seconds, the UFO landed lightly, “like a bubble”, in a small field. Burns said it resembled an “upside down toy top” and was about 90ft high. There was a blue glow around the base of the machine. The sighting was investigated by a professor at a college in Virginia who passed on his research to the US Air Force. He said he picked up “tremendously high reading of radiation” at the scene and a 14 year old boy said he had also seen a large UFO travelling in the same direction. The boy’s parents corroborated his story. The Project Blue Book report reads that there was a lack of evidence and placed the sighting in the psychological category. A man was riding his bike on the highway when he saw what looked like a “very powerful flare” and four silhouettes that resembled human beings. Afraid of an ambush, he ran away and stumbled on a nearby house, where he met a couple and told them what he had seen. Together, the three watched the light as if blinked from white to dull red. Near to the light they saw three men, about 4’9″ tall. They were immobile, dressed in greyish, beige outfits. The light faded and flew away. When they returned to the scene, with the police, they found the highway had been marked with forms, “black as the casting of costly tar”. The substance was soft and slightly stuck to the ground. Although the witnesses were described as “very trustworthy people” in the investigation, the report was classed as “unreliable”.